Our beautiful model is our beloved Bella. I miss her so. One Christmas I made these for family. A big fleece blanket with two pillowcases. 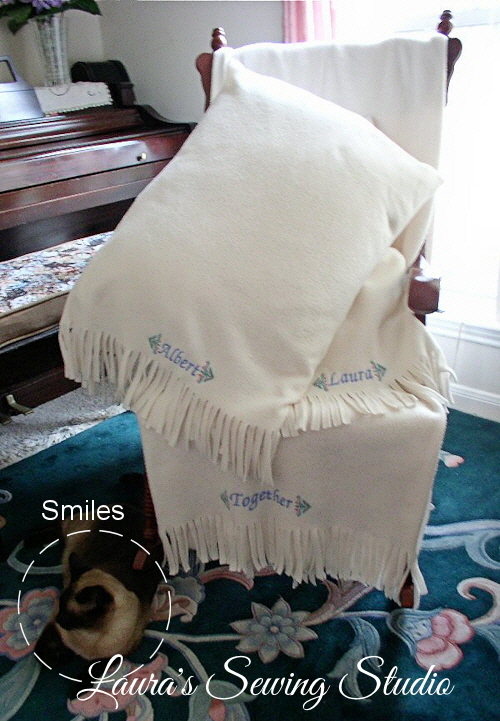 Both personalized with name, monogram, or message. The fringe was cut the same as the fringe on the fleece throw project. These are embellished with the designs and font already in my machine. The fabric is from JoAnn’s but most places that sell fabric also sell fleece. Watch summer and early fall sales. Look for the ones that say they will not pill. Otherwise, all will not look good with wear and after the first washing, degrading quickly after that. Fleece is knit fabric. It does not ravel. Even though I used the full width of the fabric, I serge finished the both edges. Still, leaving them without the serging looks good too. A hand-sewn blanket stitch is also very attractive. If you find yourself in need of a quick hand-made item for a gift keep this in mind. Because after all, if everyone around you knows you can sew that’s what they expect – right?